Referans Translation Services is a certified translation service provider (TSP) as per the ISO Standard TS EN ISO 17100 “Requirements for Translation Services” that includes provisions for TSPs concerning the management of core processes, minimum qualification requirements, availability and management of resources, and other actions necessary for the delivery of a quality translation services. Resources. The standard establishes qualifications and professional competences of translators, revisers (bilingual editors), reviewers (monolingual editors), project managers, etc. And it requires recording regular maintenance and updating of required competences. Pre-production processes and activities. The standard details the requirements for handling requests for quotation, enquiry and feasibility assessment, the agreement between the client and the translation company, handling project-related client information, administrative activities, technical aspects of project preparation, linguistic specification, and other relevant factors. Production process. The different stages of the production process are discussed: translation service project management, document translation and check by a professional translator, in-depth revision by a second linguist (bilingual editing), review (monolingual editing by domain specialists) and proofreading (target language content revision and correction before printing) when the client hires any of these two value added services, and the final verification and release of the translation by a qualified project manager. Post-production processes. The ISO 17100 quality standard highlights the importance of interacting with the client, both in the initial translation services agreement where all the special features of the project are gathered, and in managing possible modifications, claims, feedback, customer satisfaction assessment and closing administration. 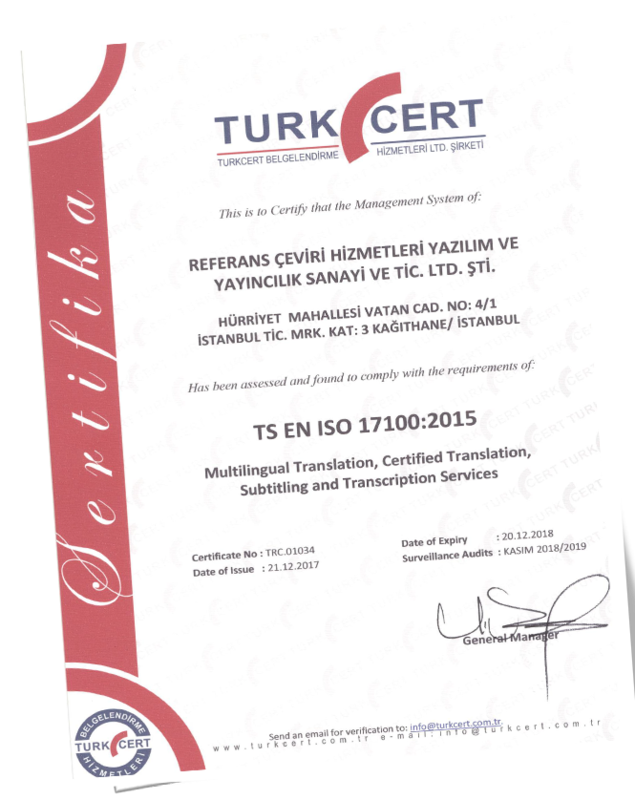 The most important feature of the IS0 17100 Quality Standard is the definition of the translation process, in which the translation is just one of the steps of the process and does not guarantee quality if no revision by a second translator is carried out, as well as the precise definition of the professional abilities of each of the participants in the translation process, principally the translators, revisers and translation project managers.